Van Gogh, a Spanish Lavender, is graced with light chartreuse green flowers and leaves. The Lavandula flower corollas are a wonderful lilac like shade while the bracts on top are a mix of cream and chartreuse which makes the flowers really standout from the rest visually. This Lavender is relatively new stoechas and one of my favorite Lavender flower color combinations. Lavandula stoechas Van Gogh is hardy in zones 8 - 10 and grows to about 2 feet tall and wide. 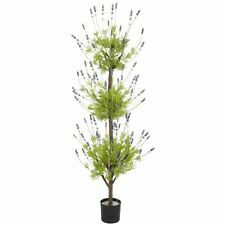 Van Gogh has a strikingly beautiful color combination and is an unusual Lavender plant that will definitely be noticed for all the right reasons.